Opium refers to the dried extract of the poppy plant (Papaversomniferum) which belongs to the family Papaveraceae. Opium refers to the dried extract of the poppy plant (Papaversomniferum) which belongs to the family Papaveraceae.This plant grows well in India, but its cultivation is banned except on license obtained from the central government, for growing the plant strictly for the pharmaceutical industry. Such a license is issued only for the states of Rajasthan, Uttar Pradesh, and Maharashtra. India produces 70 to 80% of opium that is used worldwide by pharmaceutical companies to manu-facture several vital drugs including morphine, codeine, and pethidine. Unfortunately, a significant quantity of opium is funnelled clandestinely into a global smuggling racket which feeds the illicit drug trade flourishing in Western countries. · the glabrous stem by their cordate base. The leaves are oblong, irregularly toothed, and slightly sinuate or lobed. · Flowers are large and may be bluish white, purple, or white in colour. 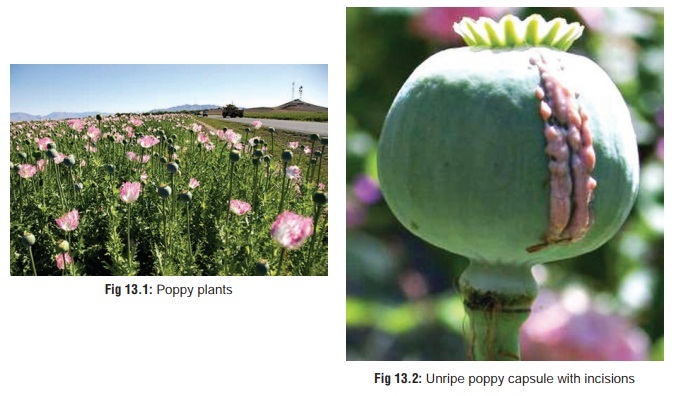 · Each plant bears 5 to 8 capsules which are incised in their unripe state (Fig 13.2) to extract a milky fluid that on drying yields opium. · Crude opium is a dark brown or grey irregular mass (Fig 13.3) with a characteristic odour and bitter taste. · Phenanthrene group: morphine, codeine, and thebaine. · Benzylisoquinoline group: papaverine and noscapine(narcotine). Apart from these natural derivatives there are several other drugs used in pharmacotherapeutics which are either semisyn-thetic or synthetic analogues. Examples of other derivatives include alfentanil hydrochloride, alphaprodine, anileridine hydrochloride, diprenorphine, ethoheptazine, ketobemidone, meptazinol hydrochloride, methylfentanyl, pholcodine, remifen-tanil hydrochloride, and sufentanil citrate. When referring to these derivatives, there has always been confusion in termi-nology. While strictly speaking, the term “opiate” refers to natural and semisynthetic derivatives, and the term “opioid” is a more inclusive term applying to all agonists and antagonists with morphine-like activity, for the sake of convenience (and to avoid confusion),—natural, semisynthetic, and synthetic. · Opiates have tremendous pharmacological importance, and are used for various therapeutic purposes (Table 13.1). · The usual fatal doses (as well as usual therapeutic doses) of common opiates are listed in Table 13.2. There are three major classes of opiate receptors to which different opiates bind with differing affinity. · The m (mu) receptor is also known as OP3 and consists of 2 sub-types: m1and m2 (OP3A and OP3B). Most of the clini- cally used opiates are relatively selective for m receptors reflecting their similarity to morphine. · The k (kappa) receptor is also known as OP2 and consists of 3 subtypes: k1, k2, and k3 (OP2A, OP2B, and OP2C). The d (delta) receptor is also known as OP1, and is said to be important in spinal and supraspinal analgesia. Subtypes d1 and d2 have been postulated to exist, but not confirmed so far. · The s (sigma) receptor originally thought to be an opiate receptor is no longer considered to be opioid in nature since it is insensitive to naloxone, which is the most important characteristic of such receptors. However some opiates such as dextromethorphan and pentazocine are s receptor agonists. Stimulation of s receptor produces psychotomimetic effects and movement disorders (both of which have been reported with dextromethorphan and pentazocine). · Two more receptors have been postulated to exist, but not demonstrated so far: e (epsilon) and z (zeta). Mu and delta receptors appear to be involved in systems that influence mood, reinforcing effects, respiration, pain, blood pressure, and endocrine and gastrointestinal functions. · Kappa receptors are able to produce endocrine changes and analgesia. In human subjects kappa agonists appear toproduce dysphoria, rather than euphoria. · Respiration, which is controlled mainly through medullary respiratory centres with peripheral input from chemorecep- tors and other sources, is affected by opiates which produce inhibition at chemoreceptors via mu opiates receptors and in the medulla via mu and delta receptors. Tolerance develops more quickly to euphoria and other effects than to respira-tory effects. · In general, most opiates are readily absorbed from the GI tract,* and also can be administered by subcutaneous, intramuscular or intravenous injection. However the effect of an oral dose is usually much less than that obtained on parenteral administratrion due to significant first-pass metabolism in the liver. For example, the bioavailability of oral morphine is only 25%. · Extent of protein-binding is variable depending on the exact nature of the opiate, and varies from 7% for codeine to 96% for buprenorphine. Morphine displays protein-binding to the extent of 34%. · The major metabolic pathway of morphine is conjugation with glucuronic acid to produce morphine-6-glucuronide which is also pharmacologically active. Excretion occurs n the urine as morphine-3-glucuronide. · Duration of action of opiates varies from 2 hours (pentazo- cine, pethidine) to 4 hours (morphine, codeine, heroin), to 8 hours (methadone, buprenorphine). Fentanyl, alfentanil, and surfentanil are ultra-shortacting (few minutes to 1 hour). · Respiratory depression, vomiting, vertigo, dysphoria, miosis, constipation, hypotension, urinary retention, and pruritis are commonly encountered. · Pruritus is a common adverse event following the adminis-tration of opiates, particularly morphine sulfate. · Priapism may be induced by opiates due to their sympa-tholytic actions which may induce an unopposed cholin-ergic state that could result in Ach-induced vasorelaxation involving NO pathways. Alpha-blockade has also been postulated as a mechanism. Autonomic system dysregula-tion appears not to be dose-specific. · Depressant effect of opiates is enhanced by alcohol, pheno- thiazines, cyclic antidepressants and Monoamine oxidase inhibitors (MAOIs). · Concomitant administration of cimetidine can result in mental confusion. · The triad of coma, pinpoint pupils, and respiratorydepression is said to be almost pathognomonic foropiate poisoning. Such cases may be due to therapeutic overdose, accidental overdose (in addicts), or deliberate overdose (suicidal). The important clinical manifesta-tions are summarised in Table 13.3. · Pupils are usually pinpoint (Fig 13.4) but may be dilated in the presence of severe acidosis, hypoxia, or respira-tory depression. Pethidine often causes mydriasis. · Hypotension may be due to opiate-induced arteriolar and venous dilation. While bradycardia is said to be common, tachycardia and ECG readings of sinus tachycardia and nonspecific ST-T segment changes have been reported. · Bradypnoea is common in opiate poisoning. Respiratory rates of less than 8/minute are not unusual. Snoring prior to fatal opiate overdose has been reported and is likely due to a failure to maintain the patency of the upper airway. Gurgling may occur due to accumulation of pulmonary oedema fluid. Non-cardiogenic pulmonary oedema (“heroin-lung”) is an infrequent, but severe, complication of heroin overdose and is generally abrupt in onset (immediate-2 hours) following intra-venous heroin overdose. Manifestations include rales, pink frothy sputum, significant hypoxia, and bilateral fluffy infiltrates on chest X-ray. Some patients require mechanical ventilation. Resolution of symptoms usually occurs rapidly with supportive care alone, within hours to 1 to 2 days. · Morphine-induced seizures are primarily seen in neonates. · Cramping and constipation as well as sphincter of Oddi spasm may occur. · Hyperkalaemia may occur following an overdose, especially in the presence of rhabdomyolysis and acute renal failure. · Most opiates cross the human placenta. They have been shown to appear in the foetal circulation within 5 minutes following maternal IV injection. Morphine appears to act as a vasoconstrictor of the placental vascu-lature, causing a significant decrease in the biophysical profile score as a result of absent foetal breathing move-ments and a nonreactive nonstress test (NST). If delivery occurs quickly following an opiate dose to the mother, or after adequate time has passed to allow for maternal clearance, it is unlikely that the foetus would be affected. Foetuses demonstrating significant distress and acidosis and whose mothers received opiates 1 to 3 hours prior to delivery, or multiple doses, may be at increased risk for respiratory depression, which would most likely be multifactorial in origin. · The American Psychiatric Association has laid out diagnostic criteria for opiate dependence and for catego-rising the severity of such dependence (Table 13.4). o Unusual mood swings, periods of depression alter-nating with euphoria. o Withdrawal from family, friends, and social activities. –– Frequent domestic strife. o Long hours of unexplained absence from home. o Frequent conflicts with law (e.g. driving offences). o Pills, syringes, etc. lying around the house. o Bloody swabs or tissues lying around the home or in the woking place. o Periodic disappearances into a locked room (bath- room, bedroom, etc.). o Periodic withdrawal manifestations— sweating, tremors. In addition, an addict may have dermal scars (from intra-venous abuse) (Fig 13.5), and suffer from amnesia, confusion, and occasional hallucinations. Compartment syndrome may occur following abuse of narcotic injections, such as heroin.Abrupt cessation of opiate intake can cause a withdrawal reac- tion (cold turkey). * Common manifestations are mentioned in Table 13.5. Neonatal withdrawal may be seen in the infants of addicted mothers 12 to 72 hours after birth. Infants may be dehydrated, irritable, and experience tremors and cry continu- ally and may have diarrhoea.